So Sue and I purchased a new oven and the oven and I are getting to know one another. My first bakes turned out a lot of breads that didn’t brown very well. 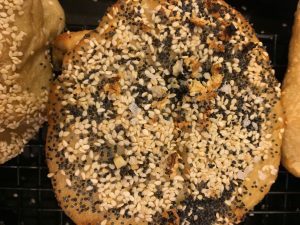 This everything bagel (sesame, poppy, salt, and toasted garlic) tasted great. They were very chewy and were really authentic, but alas, a little flat and pale. 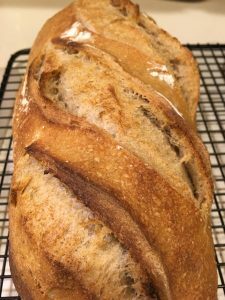 This fancy recipe pumpkin sourdough looked fine enough, but there was a problem. 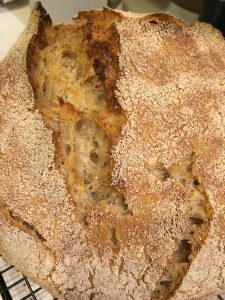 My longtime Cripple Creek sourdough (1893) had caught an infection. Don’t ask: little filamentous things growing on top and cheesy smell. I tossed it and in reviving a dried sample I had in storage I failed to wait a sufficient number of days before trying to bake with it. The result was a pumpkin bread that looked good, but didn’t rise. And these two loaves which also looked good but never cooked in the middle. 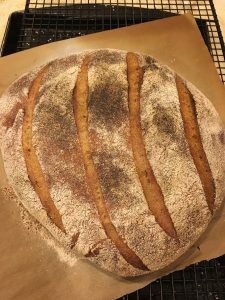 The same insufficiently mature sourdough meant the bread didn’t really spring in the oven. I was getting closer, however, to figuring out how to get the breads to brown in the new oven. 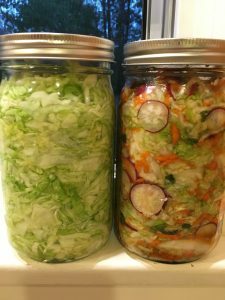 In the interim, Isaac and Delaney made sauerkraut (left) and kimchi (right), both natural fermentations, and both very tasty. And finally, the oven and I have begun coming to agreement. Check out the ears on the cuts of this spelt-rye baguette. 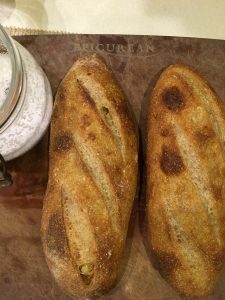 When professional bakers score their breads they aim for a cut that peels back in the oven and toasts just a bit as it rises above the loaf. My first success.